New Europe is taken from the TV series of the same name that was first aired in the autumn of 2007 (and has been playing on cable ever since). The book is a collection of photographs taken during filming combined with what appears to be the script from the series. Palin's voice is unique. You can almost hear him speaking as you read the words, and if you have watched the programmes, this gives a strong sense of deja vu. He travels around the European nations of: Slovenia, Croatia, Bosnia & Herzegovina, Albania, Macedonia, Serbia, Moldova, Turkey, Bulgaria, Romania, Hungary, Ukraine, Estonia, Latvia, Lithuania, Kaliningrad (Russia), Poland, Slovakia, Czech Republic and Germany. But that's the prevailing spirit of Palin. The gently absurd sticking its tongue out at you from the fringe of a more considered view of the place. This is generally an enjoyable and informative coffee table read. You can brush up on your geography, have a little snigger at the bizarre habits of the population, then reflect on the scale and diversity of the continent. 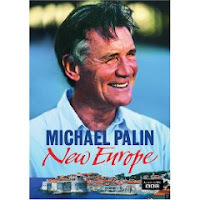 New Europe is available to read on the Palin's Travels website.